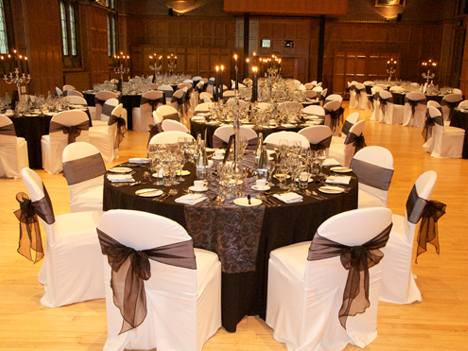 Deborah, the events manager at Sheffield University asked if Sweetly Seated could dress the chairs in Firth Hall – an impressive yet charming venue for a special upcoming event. As I have dressed chair’s at this venue many times before for both weddings and corporate events such as graduation dinners and also Master Chef, I didn’t hesitate to say ‘yes!’. I was honoured to discover that this event was extra special as the Queen and the Duke were visiting Sheffield to open a new university building and would be proceeding onto Firth Hall for an afternoon lunch. 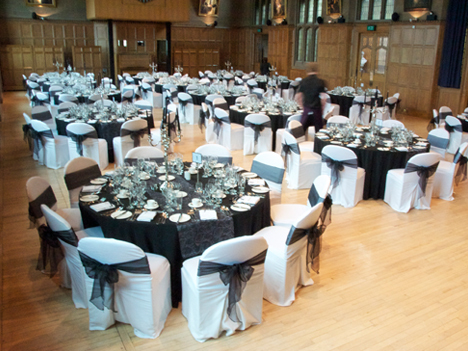 The atmosphere at Firth Hall was amazing, the setting oozed character and I was privileged that Deborah had placed her trust in the Sweetly Seated Chair Cover Hire team to make the room look fit for a Queen. Working along side Deborah we decided the colour theme would be deep rich vibrant reds. We dressed the chairs in crisp white chair covers, adding the rich deep red organza sashes wrapped round the chair, tied in a simple bow at the back. This gave the room a sense of warmth, a sense of richness, a sense of grandeur to the already stunningly beautiful room. The room looked idyllic, and what made it all so special was that our team at Sweetly Seated achieved in making this event memorable for the Queen and the Duke.